Why are you so upset about the Critical Summary document? What is wrong with Jackson’s Fall Through proposal? It is the only one that works with the data. Actually, I think Critical Summary 3.0 is a step in the right direction – maybe a couple of steps. Far from being upset, I am excited about the prospects of debating the data it contains. And maybe with input from others the Critical Summary will improve. It is only at 3.0, after all. I blog not to upset the apple cart but to seek the truth. That means taking a bite out of each apple in the cart to see how it tastes (wow, that’s a scary metaphor if you’re a Genesis 2:17 literalist). No image can be found under the bloodstains. Have we resolved the matter? Maybe. I’m okay with it if we say that it is probably true (I hate to be such a curmudgeon). Maybe we can say, “No image has been found.” You have to read Hugh Farey on the possibility of image color under bloodstains along with all of the comments, especially those by Kelly Kearse, Thibault Hiemburger and Hugh. Maybe on Page 73 I’d want to recommend a small x under Contact (F1.0) and maybe I’d like to count this whole row as more important than the Bone Structure row. That’s just me being difficult. And if the picture above is blood on the face (is it? – See A Guest Posting by O.K. : Blood on the face of TSM? ) then how can we comfortably say there is no image under bloodstains? Just asking. And I don’t have a problem with Jackson’s Fall Through hypothesis, per se (unless I try to say per se because then I do). It is ingenious. I’m just not ready to accept it based on what I see. And something in my gut still tells me that images don’t get caught on camera, so to speak, by energetic byproducts of miracles. It’s the curmudgeon in me. That’s a subject for another day. I should add, while I think the shroud is probably real, I am not prepared to accept any of the hypotheses discussed in Critical Summary based on image characteristics. It was Heller and Adler’s finding that whereas ‘image’ fibres were ‘corroded’, ‘blood’ fibres were not ‘corroded.’ That’s all. Not: “These experiments revealed that there was no image beneath the blood or beneath the blood serum at the boundary of the tested bloodstains. The image colour was found to terminate consistently at the boundary of the bloodstains.” It was Heller and Adler’s conclusion that the process of creating the image corroded the fibres of the Shroud, and that therefore that process had not occurred in the region of the bloodstains. Later Rogers disagreed with them, and in this respect agreed with McCrone, that the image was formed on something covering the fibres, and that there was no corrosion of the fibres themselves. It is my contention that any fibres from a bloodstained area could all be considered ‘blood’ fibres, as the blood soaked all over and through the cloth, whereas, even if there were image beneath the bloodstains, only a tiny proportion could be considered ‘image’ fibres as the image formed only on the very outer fibres of the crowns of the warp threads. The chances of a randomly selected fibre from such an area being an ‘image’ fibre at all are thus very slight, even if there is actually image under the blood. Furthermore, the blood has largely eroded from the top surface of the shroud, from exactly the place where the image and the blood could have coincided, and ‘blood’ fibres are more typically found in the weft ‘valleys’ where there is no image anyway. 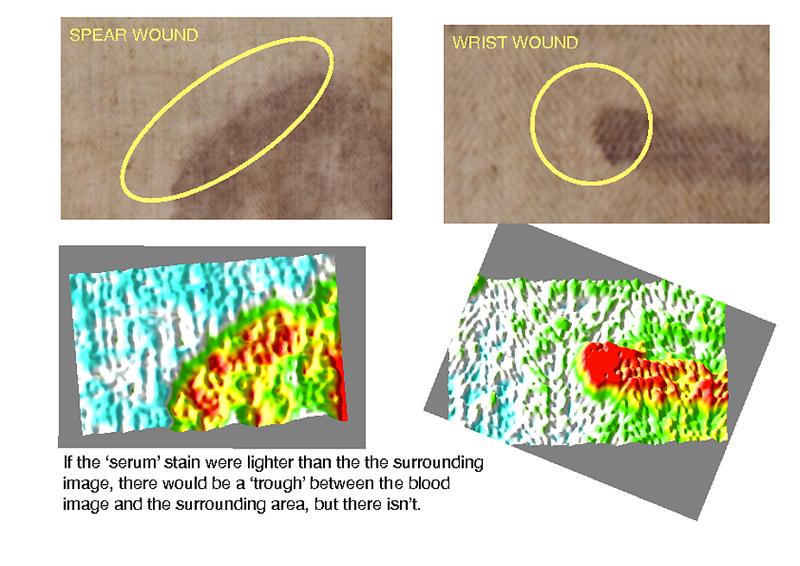 The UV images show a pronounced halo of ‘serum’ around the tip of a fingerlike bloodstain emerging from the wrist wound, and another along the top edge of the spear wound. (There are others, of course). However, there in no change in colour or intensity between the ‘serum’ areas and the adjacent ‘image’ areas when viewed in visible light. If there is no image beneath the serum then the colour of the serum exactly matches the colour of the image – an extraordinary coincidence that I don’t believe. See below. The first is that the blood must have arrived before the image. I don’t agree that it must have been, for the reasons outlined above. The second is that there is no evidence of artistic materials on top of the bloodstains. This conclusion is not based on the evidence above (about corroded fibres), and is not true, as both red ochre and vermillion were found, both by Heller and Adler and McCrone. This is evidence. It may be discounted or explained away, but to claim that there is no evidence is simply wrong. The third conclusion is that there is no ‘major damage’ to the bloodstains. This also is nothing to do with the corrosion evidence cited above, and is also highly disputable. What on earth constitutes ‘damage’ to a bloodstain? I think the authors mean that the bloodstains are not smeared, which shows only that they were dry before anything in contact with them was moved. They do show a fair amount of abrasion and flaking off, which to my mind is just about the only ‘damage’ a bloodstain can sustain. There is some suggestion that an artistic rendering of the image is ruled out by the lack of ‘damage’ to the ‘blood’ (…”resulting from an artistic effort to create the colored image fibres.”), a comment which makes no sense to me. “If” the blood was transferred to the cloth before the image then it is TSC’s judgment that any subsequent artistic effort to create an image would leave evidence at the boundary of blood and serum retraction rings. No such evidence has been found. To the contrary the boundary between image and blood has shown remarkable coordination in the areas observed. The colored image fibers are colored up to the boundary. There is no evidence of a coloring agent being applied beyond the boundary, i.e. paint being applied beyond the boundary over the blood. If the artistic method was a bas relief using a heated object then the blood areas would be damaged or even obliterated. Microscopic observations of the Shroud blood areas have not shown any degradation due to heat with the notable exception at the intersection of bloodstains with fire damage to the Shroud from the 1532 fire. This interpretation of the evidence is what the Critical Summary is attempting to express. Ah. I understand what you mean now; thank you. You wrote an interesting observation on serum halus and U.V. photographs nevertheless I feel compelled to comment on another issue. This is simply not true and may be misleading for someone not aware of Professor Adler and Professor Heller’s work. If it is true that Dr.McCrone claimed he found red ochre and vermillion because the Shroud had to be a painting HIS CONCLUSIONS WERE PROVEN WRONG. Professors Adler and Heller found red particles with different refractive indexes so called birefringent and non birrefringent red particles. The non birrefringent. red particles are hematic material where iron is bound to heme group of Hemoglobin. The birefringent red particles correspond to Iron oxide resulting from the charring of blood and from oxidation of iron mainly in water stains. This form of iron oxide is clearly distinguished by them from the natural pigment red ochre because there is no contamination with Ni Co and Mn. They don’t mention «vermillion» either. what they found in their microscopical survey of the slides was a prysmatic hexagonal crystal and fragments of it« in the same area along a definite track» that was identified as cynnabar.(HgS). What you failed to quote from my comment was: “It may be discounted or explained away, but to claim that there is no evidence is simply wrong.” And indeed, both you and Heller devote some time to discounting the evidence, which is fair enough. However, there are discrepancies in the discounting, the resolutions of which which are matters of opinion. Heller decided that he couldn’t find any more cinnabar, while McCrone decided that he could find quite a lot. Without going back to the tapes ourselves, we cannot determine the truth of either of their conclusions. Heller (and Adler) found three forms of iron oxide, one of which “the chelated form” was found throughout the Shroud and supposed to be part of the retting process; another, the “heme bound form” is attributed to decayed blood, and the last, Fe2O3 (red ochre), was found “primarily in the water stain margins and charred blood areas indicating that it only constitutes a very small percentage of the total iron forms found on the Shroud.” McCrone disputes this, and finds particulate iron oxide on all image fibres, but not on background fibres. However, in his “X-Ray Fluorescence Investigation of the Shroud of Turin”, R.A.Morris found a direct correlation between image intensity and iron concentration, from 16.8ug/cm2 on the nose to 9.6ug/cm2 in the imageless space between the cheek and the hair. This is in direct contradiction to Heller’s conclusions, and agrees with McCrone. You may, of course, be correct, and even if you’re not, you are entitled to put your point of view, but a point of view is not evidence. Nor proof. To claim that McCrone’s conclusions were proven wrong (or even PROVEN WRONG) is not true. The particles of red ochre and vermilion may have derived from paintings placed on the Shroud, but this is not proven either. The fact that you, and many others, are convinced that the Shroud is not a painting does not of itself discount the evidence suggesting that that it is, and it certainly doesn’t mean that the evidence doesn’t exist. greyscale): red dots (only indicative because of the great scattering of the values). I invite commenters on this blog to draw their own conclusions…. ps. I’m not a Doctor. But you may still be, don’t you, Hugh? Thanks OK! I may be one day!! In Portugal the standards of academic degree allow me to name you Dr. because as far as I know you are a Science teacher. Actually not only medical doctors have Dr. written before their name. That’s very generous of you, Antero. Thank you. Hugh: ” However, in his “X-Ray Fluorescence Investigation of the Shroud of Turin”, R.A.Morris found a direct correlation between image intensity and iron concentration, from 16.8ug/cm2 on the nose to 9.6ug/cm2 in the imageless space between the cheek and the hair. This is in direct contradiction to Heller’s conclusions, and agrees with McCrone”. There is no such “direct correlation”. In fact, Morris and Al. wrote: ” Comparisons between image and off-image areas reveal no differences, within the precision limits of the data, that would indicate the presence of pigments or dyes containing high-C elements”. Including Fe. Compare for example areas 5 and 8. The color is very different but the iron content is almost the same. Statistically, there is more Fe in the nose area (areas 1 and 2) and area 10 (near a bloodstain). It’s possible (probable ?) that the nose area contains some blood particles. I do not know how precisely the areas used for the X-ray fluorescence coincide with the areas used for the light intensity, and do not think that the two graphs are necessarily mathematically comparable. In general, however, the darker nose and hair have higher iron contents than the lighter space between the cheeks and the hair. Interestingly, though, taking your examples, the light intensities of areas 5 and 8 appear to have values of 137 and 133. 133 is 1.5% lower than 137. The iron values given by Morris for these areas are 10.6 and 9.6. 9.6 is 11.9% less than 10.6. In other words your statement “the color is very different but the iron content is almost the same” is in fact exactly the contrary. 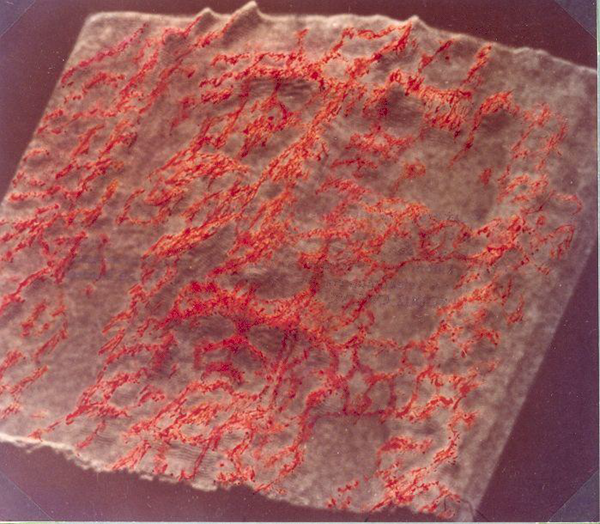 However, whatever iron may be found across the image, this is still in contrast to Heller and Adler’s contention that the iron content was uniform across the Shroud (due to retting) except in blood areas and water-stain margins. Where did you read this contention ? It is implied throughout the mention of iron in their Chemical Investigation paper, beginning with the Abstract: “Although Iron in several forms is found over the whole cloth Its distribution is shown to be accounted for by natural processes.” They spend some time discussing the presence of iron as a heme-derivative in the bloodstains, and, after producing their own khaki, say: “The uncoated fibrils (non-image, image, and water stain) all give relatively strong positive tests only for Ca and Fe, except for those from the inside of the water stains which give somewhat weaker, though still definite positive reactions.” This iron is regarding as having derived from the retting process. As to the uniformity of the iron except in the bloodstains and watermarks, they say later: “We found the calcium to be uniformly distributed over the tape sampled Shroud areas, while the iron, though also ubiquitous, was enhanced in the blood image areas and concentrated in the margins of the water stains. This is consistent with the X-ray study(l5) which showed a uniform concentration of the iron in the image and non-image areas, but enhancement in the areas of blood marks.” The uniform concentration described is not reconcilable with Morris’s findings. Wouldn’t it interact with it tough? There are a lot of metals and components in blood that I would expect to interact, at least if there is some form of radiation involved. I believe the result is an ecchymosis. can observe on that ancient linen ? But in 1239 only the crown of thorns arrives in Paris. The Mandylion, arrives either in 1241 or 1242 in Paris. As a matter of fact, the 22 relics arrive in France by three different translations. And, at no point in the documents of the Sainte-Chapelle known to us, or the formal document ceding the relics to saint Louis, do we read that it was observed that there was a facial image on a cloth as part of these relics. It is more subtle than that. Second, and most importantly, that document (i.e., A Critical…) keep repeating what many others have written without analyzing the documents of the Sainte-Chapelle by declaring that the cloth received as part of the relics was destroyed at the French Revolution. All documents of the late inventories of the Sainte-Chapelle mention an image at the bottom of the reliquary, not on the cloth. The cloth that was in that reliquary most likely disappeared much before the French Revolution. I doubt that the authors of this document (i.e., A Critical …) consulted the documents easily available to all: the inventories of the Sainte-Chapelle describing the relics of the Grande Châsse received from Constantinople. regarding your “thesis of the Sainte-Chapelle”. the most precious relic at the Sainte-Chapelle. …. that come from the Crown of Thorns)? …and onto the other relic, the Sudarium of Oviedo ? there is a lot of work to do…! Sorry… I was in a hurry. “But I would also be curious to know what is the idea by Alessandro Piana regarding your “thesis of the Sainte-Chapelle”. I am certain that Mr. Piana does not like it. Interestingly, Mr. Piana sent me a private email asking me not to ever consult his Academia web page! Because I wrote a web page that stated that the theory of Othon de la Roche is very unlikely. Mr. Piana never asked any questions or have any discussion with me. This is not a very serious behavior. Mr. Piana proposes the theory of Othon de la Roche who would have owned the Shroud and bring it back from Greece, as stated by many others. Likewise, this document titled “A Crtitical…” proposes that the history of the Shroud goes through Othon de la Roche. But the theory of Othon de la Roche is very unlikely because that theory originates from a manuscript (written in French in 1714) that made many false statements and made up the theory that Othon de la Roche brought it back from Greece. These false statements were continuously repeated by many authors since that time, until now. It is now still repeated by such document as “A Critical …” without consulting the original source of that theory. Did the people that proposes the theory of Othon de la Roche ever realized that it was first proposed by this 1714 manuscript? Did they realize that it contains many false statements regarding Othon de la Roche and the Shroud? Did they realize that the author of that manuscript is well known to have made up historical stories? As far as I know, they did not. But these do not disprove that Othon de la Roche had the Shroud at one time. Clearly, the author of pro-authenticity part of MS826 found some rumor about that, and tried to back it up with some spurious sources. Where and when, the tradition about that coffer originated? Those are (although each spurious on its own) three seemingly independent witnesses about Otto possessing the Shroud. Three testimonies are more than one -and need serious consideration. “Clearly, the author of pro-authenticity part of MS826 found some rumor about that, and tried to back it up with some spurious sources.”. Rumors to spurious sources do not make a strong case. You have to read some parts of the MS826 manuscript to realize that it is very unreliable. The author of that manuscript is now known. He made up fanciful stories about other historical facts. He is totally unreliable. Of course, he also wrote fanciful statements about the Shroud of Turin to discredit it. In a few words: it is obvious once you have read that dissertation that he made up the claims about Othon de la Roche. There is not one document that he cites that backs up what he is claiming. Is that not enough? And, again, this is not emphasized by the document written by Dorothy Crispino: all authors after that manuscript relied on these false statements. This is essential to realize that. The Ray Castle: it is a very weak evidence because it all appears to be a modern construction. I talked to people who talked to the last descendant living at the castle, countess Diane Régina de Salverte: she is tired of being asked anything about the Shroud. It is obvious to me that she does not even believe in that story. If there was an old tradition about the Shroud being at that castle there will be some stories in the family, some documents. But nothing! The coffer? It is first ill adapted by its size to carry the Shroud. And what is the tradition about it? The family has nothing to say. The replica of the Shroud at the castle? This is not even a replica of the Shroud of Turin, but of Besançon! The Ray castle proves nothing. And what the clerics at Lirey wrote: the Shroud came from Philip VI. What does the son and grand daughter said: it came from Geoffroy de Charny. Look at the inventories of the Sainte-Chapelle and everything becomes clear: the Shroud was there and it was given to Geoffroy de Charny from the king of France. It is a much simpler and reliable scenario compared to the theory of Othon de la Roche because it is coherent with much everything else that is considered reliable. There is a huge difference in the quality and accuracy of the documents. The Templars? One of the problem is that many of these documents are written in French and many modern researchers that build these theories could not directly read them. But it is necessary to read very carefully the documents written by the clerics of the Lirey chapel, the inventories of the Sainte-Chapelle of Paris, the manuscript MS 826, etc. Rumors to spurious sources do not make a strong case. T2) The coffer from Ray Castle allegedly used to transport some Shroud (again no matter whether original or a copy, or whatever). was wrapped after his death and before the resurrection […] in Athens.” Some (for example Nicolotti) maintain its 18th century forgery. The letter comes from Palermo, Sicily, almost 1000 miles away from Besancon. Anyway, the mention of the linen in Athens (ruled by Otto at that time) is complementary to T1 and T2. Now you need to use those “unreliable” sources wisely. B1) He heard the story from some seemingly unreliable source (rumors), and tried to back it with some documents in a clumsy way. If A1, then where the stories about T2 and T3 originated? Question 1: Where and when the tradition of Ray Castle coffer originated? Question 2: What are the links between obscure MS826, obscure coffer in Ray’s castle and the equally obscure letter of Theodore Angelus from Sicily? Mario, if you dismiss the Otto theory you HAVE TO adress those two questions. T2, the Ray Castle having a coffer that would have been used to transfer the Shroud (from whichever place), is largely unsupported. I am in contact with the librarian of the Ray Castle, (Jean Richardot), who has been working with the countess for a very long time. He has never heard or read anything that would backup the claim about this coffer. He currently does not know any document from the family archive that would support the current claim. The countess (Diane de Salverte) is largely uninterested in these matters and cannot provide any information about this coffer. Jean Richardot does not believe that the castle ever had the Shroud. I asked Mr. Richardot to try to find some references about the origin of the coffer at the castle. We cannot count T1, T2 and T3 as independent.T2 is likely a product of T1, and since T1 is fanciful and most likely precede T2, T2 can only be taken as a byproduct. T3 happens a long time after T1. So T1 appears as the culprit in producing T2 and T3. You also have to explain how the Shroud would have been transferred from the la Roche family to the Charny family. And there, it is even more difficult. As for T3, it should be analyzed more carefully, but it does not say that Othon had the Shroud, so it might be unrelated to the Ray castle. My current take of it: it is a forgery and should be analyzed with that hypothesis in mind. All right Mario, but let’s face the consequences of your claims. We cannot count T1, T2 and T3 as independent.T2 is likely a product of T1, and since T1 is fanciful and most likely precede T2, T2 can only be taken as a byproduct. Fine. You claim that someone invented the story of Otto in obscure MS826 (T1). Question: Do you believe that the coffer was deliberately installed (or labelled as used to transport the Shroud) by some conspirators to back the claim that Otto once had the Shroud? Not true. The document was rediscovered in 1981, but is much older. Even Nicolotti, who claims it a forgery, thinks it was made between 16th and 19th century. It does not say the Otto had the Shroud, true. But this is not a problem, as I have a hypothesis that in 1205 Otto wasn’t the owner of the Shroud yet. Do you believe in two corresponding forgeries in two obscure documents from about 18th century 1000 miles away? I answered already. Yes, I believe so, because these events are known to us as having happened in sequence. T1 occurred, then T2, then T3. Distance is irrelevant because T1 started to be well known by the time T2 and T3 occurred. Is that an answer or not? Answer, yes. But wrong IMHO. Are you sure T1 occured first, then T2, then T3? Can you give dates (or period at least) when T2 and T3 were fabricated? And by whom, for what purpose? As for the Golden Bull, it says only that there was allegedly some undescribed “sanctam toellam” which is “tabulae insertam”. It says nothing what this cloth (if there was actually any inside, which is not certain) was, less it was a Shroud. And still you have to think out how the Shroud allegedly disappeared unnoticed from the reliquary inside well guarded Sainte Chapelle. What I meant: from what we know for sure, T1 first occurred, then T2 because there is no known statement regarding that fact before the 20th century (none that I am aware of), and the document for T3 was discovered in 1981. As I already wrote, we have to confirm T3, it might have been a copy done before T1, which then would prove that it cannot depend on T1. But until it is dated, we have to be careful declaring genuine, be cause we know that what is being written in T1 is fanciful. As for T2, the only confirmation we have is that the coffer was presented as such in the 20th century. Researchers who say that it is a tradition of the Ray family that this coffer was used to transport the Shroud cannot give any reference. Is it a statement from the current owner of the castle? Who in the Ray family says so? The current owner cannot confirm anything and the current librarian cannot confirm anything either. The archives of the castle could be searched, but currently the coffer is a very weak element. By whom? We do not know. For what purpose? We can only imagine, but as for T1, someone is trying to get some attention, and why not some nice publicity for the a family? For a castle? “sanctam toellam tabulae insertam” means “a holy cloth inserted in a table”. So, I do not see on which basis you write “if there was actually any inside, which is not certain”. So, according to you the text is not clear that there is a cloth inserted in a table? Now, if you look at all inventories of the Grande Châsse, this “table” is the reliquary described as a box with the known dimension well described by inventory R. This identification can be done by a simple one to one correspondence of all relics and reliquaries described in the Grande Châsse with the relics listed in the Golden Bull. This is not ridiculous at all. I think you are not aware of some essential and well known historical facts about the Sainte-Chapelle, the relics, and what the King of France could do with these relics. The King of France had absolute control of the relics of the Grande Châsse, he considered these his own possession. This is extremely well attested historically. He could give parts of relics to whoever he wanted without the permission of anybody else and without reporting it to the clerics of the Sainte-Chapelle, if he wanted it to be so. This is well known. The King could take any part of a relic and gave it to whoever he wanted, if the need was there and the clerics would not notice for a while. As a matter of fact, you can see the confusion occurring at inventory L where they can no longer clearly find the content of the Mandylion reliquary. Something really strange occur during this inventory. It is even possible that the clerics did not look inside the reliquary for a very long time (many decades), because there was no need to do so. The inside of the reliquary of the Mandylion has never been described by anybody besides the clerics and they did so very rarely are far as we know. There is no known exposition of the inside of the Mandylion reliquary when it was at the Sainte-Chapelle. Not one. I think you need the read the entire exposition of the five questions in detail, because I am essentially repeating what is written there. I have addressed what you have raised in that document. The King and the clerics appear unaware of what that cloth is. The Latins have no idea that a cloth with an image of Christ existed in Constantinople. Robert the Clari is an exception. This is obvious once you have studied the appearance of the legend of the Veronica. Note that it is not “someone”, but the author of that manuscript. The “obscure” MS 826 is no longer that obscure. The author is known, the year of its redaction is known. And we can trace the story of Othon from all subsequent authors to that manuscript. This is important to realize that main point. Nothing points outside of it in terms of *all* the literature that was written about Othon and the Shroud. I think that you are thinking that the coffer was at that castle since a long time ago (15-17th century). There is essentially no proof of that, and everything looks like it is a recent modern addition of that coffer shown to the visitors to the castle. One clue is the plaque nailed to it (the plaque really looks modern): why would you do that to a very old coffer? The addition of a copy of the Shroud of Besançon in the castle is another clue that it is a modern addition to the castle. It most likely is a 18th – 19th century copy, which could have been put there in the 20th century. So the set up appears as an idea of previous owners who heard of the story propagated by T1. When was the coffer put in the castle? Currently nobody knows with precision, but again, the current owner has no idea and there is no one piece of family tradition that shows that it was there for a very long time. No document from the archive. Sorry, I keep repeating it: all current knowledge about the coffer points to a modern (probably 20th century, perhaps 19th century) addition. It is not a “conspirator”. The placement of the coffer did not occur at the same time that the MS 826 was written. Again we have no reliable source in the family archive stating when the coffer was labelled as such. It is conceivable that it is one of the owner of the Ray castle who probably started to believe in the story of T1 and guessed that this could be the coffer used. And again: How do you explain the transfer from Othon to Lirey? All transfers that I am aware of contradict reliable statements made by the son and grand-daughter of Geoffroy de Charny. On the other hand, the Shroud going through the Sainte-Chapelle have none of these difficulties with extremely reliable documents: inventories of the Sainte-Chapelle having a strong pedigree. And strongly reliable historical events (the transfer of the relics from Constantinople). It is a world apart from such scenario as Othon de la Roche. As for T3, it shows up recently (1981). That is what I meant about T3 being much later than T1. So, it appears suspect considering that T1 is a made up story. What is the age of this copy (letter to Innocent III)? We do not know. It could be modern. A close study of it should be done. And again: How do you explain the transfer from Othon to Lirey? First, this is another issue, irrelevant here. Between Othon and Geoffrey de Charny, the Shroud could pass through many hands during those 150 years gap.We don’t know many fascinating stories that could have happened then. I think that you are thinking that the coffer was at that castle since a long time ago (15-17th century). There is essentially no proof of that, and everything looks like it is a recent modern addition of that coffer shown to the visitors to the castle. characteristic of the second half of fourteenth century. So most of the coffer is actually a reconstruction, but this is irrelevant. The only thing that matters is that this coffer was considered the one used to transport some Shroud by Otho. The label apparently must have been placed there in agreement with the castle owners, descendants of the Ray family. I don’t see if they had any interest in faking that tradition. t is conceivable that it is one of the owner of the Ray castle who probably started to believe in the story of T1 and guessed that this could be the coffer used. Haven’t you considered the opposite way? That the author of T1 actually obtained the info about Otto from his descendants living in Ray Castle, and then manipulated some sources to provide “documentation”? It is also conceivable scenario. The castle actually is about 40 km away from Besancon, that’s relatively far for pre-automobile society, a day or two walk from the city. It is possible that the story of Otto was unknown at Besancon at that time, when the city boasted possession of alleged Shroud. On the other hand, the Shroud going through the Sainte-Chapelle have none of these difficulties with extremely reliable documents: inventories of the Sainte-Chapelle having a strong pedigree. And strongly reliable historical events (the transfer of the relics from Constantinople). It is a world apart from such scenario as Othon de la Roche. Yeah. So where are documents ascertaining us that the Shroud (not alleged Mandylion) was actually in Sainte-Chapelle? Besides one thing can be sure: had the French King been aware ownership of the Shroud, he would never let it go out of his hands. This is nonsense. No, Mario. The document itself is much older. It was once a part of so called Chartularium Culisanense codex from Palermo, a codex of document of Saint Sophia Order, associated with Sicilian de Angelis family. The Chartularium itself was lost during WWII, but there was a 18th century transcript of some documents (including the letter to Innocent III), testified in 1859 by Benedetto d’Acquisto, arcibishop of Montreal, and former abbot at Monte Casino, considered distinguished humanist. The document is spurious, and as a copy, it is likely interpolated. But that’s not so important, as the info it contains about sacred linen in Athens in 1205. This is consistent with Otto theory. Do you believe in two corresponding forgeries in two obscure documents from about 18th century 1000 miles away from each other? No this scenario is not conceivable. The author of MS 826 was desperate to find any documentation that would have supported his claim. If he had gotten from the descendants of Otto any information in favor of his thesis (the Shroud of Besançon is authentic) he would surely have done so. Don’t you think? Instead he is making up and distorting information. You really need to read the entire MS 826 dissertation in favor of the Shroud of Besançon to get a sense of what this author is saying. Then, count the number of true supporting facts and the distortion he is presenting about many of these facts. That source is totally unreliable. Now you are thinking that he might have had some genuine information. I drove from Besançon to the Castle of Ray-sur-Saône. It was 51 km using the departmental roads. But this is largely irrelevant. Of course, there is no explicit mention that the Shroud was at the Sainte-Chapelle. You need to read all the inventories to realize one essential element: the clerics received the Mandylion (convince your self by reading the inventories, which I translated on my web page), then they describe it without knowing anything about the Mandylion. That points to a clear fact: the Mandylion is totally unknown from the Latins in the 13th century. This is a subtle point that transpires from the inventories. Read the inventories, you will see. As to your paper, you have done fantastic job, and I am very grateful, even if I disagree with your thesis. Nevertheless, material you gathered will be very useful. I have read it briefly before, I knew some fragments from other sources. I am now, and continue studying this in depth. But I would suggest a different view. Haven’t you considered the fact that when the reliquary reached Paris about 1241, it was already empty? Emptied in 1204. That’s why the clerics actually knew nothing about what was stored inside before. Because I am sure they would have noticed, if not the image, then the bloodied cloth at least inside. I have answered that already. There are not two forgeries. Which two forgeries are you referring to? The MS 826 is not a forgery. It is written by a completely incompetent historian. The letter to innocent III: it needs to be analyzed more deeply and dated. But the existence of T1 which makes up the story about Othon is enough to put major doubts in that story. Again: the coffer at Ray castle is far from a proof. The person that probably knows the most about it is the librarian at the castle. I have talked to him: there is no proof (no document and no tradition in the family) that this coffer was used to transport the Shroud. It appears as an invention from someone in the Ray family. Would like to verify that with him directly? Of course. This is an explicit point I discuss on the web page about the theory of the Sainte-Chapelle: showing that the Mandylion did read the Sainte-Chapelle. See http://sindonology.org/sainte-chapelle.shtml#ans:mandylion_reach. I do not assume that this the Shroud of Turin. See the five clearly separate questions with answers on the web page http://sindonology.org/sainte-chapelle.shtml. Search for “Did the reliquary of the Mandylion reach the Sainte-Chapelle?”. Then you can read all five questions with answers. This is the central discussion of this web page. The rest is there to support these answers, answers the objections that many have raised (that you may also have), or add elementary information about the Sainte-Chapelle. In Constantinople there might have been other cloths used in Jesus’ tomb (or claimed to be), but only one had an image: what Robert the Clari saw, which is conceivably the Mandylion. There are not two forgeries. Which two forgeries are you referring to? The MS 826 is not a forgery. It is written by a completely incompetent historian. The letter to innocent III: it needs to be analyzed more deeply and dated. But the existence of T1 which makes up the story about Othon is enough to put major doubts in that story. The claim that Othon possessed the Shroud (no matter which) is one alleged forgery. The tradition about that coffer, if false is a second forgery. The letter to Innocent III, claiming the presence of the Shroud in Athens 1205 AD, is the third alleged forgery. A) Either Othon did not have the Shroud, and then all T1, T2, and T3 are fakes. This is the case if the Shroud was still in Constantinople up to 1241, as Sainte Chapelle theory assumes. B) Or he had the Shroud in possession. Then all T1, T2, and T3 essentially say the truth about that, even if they have several issues with other things. What if A)? This means that all (very obscure to general public, and at least T3 is distanced from the two others) T1, T2 and T3 must have been simultaneously faked -in order to create false impression (about 200 years after alleged fabrication in case of T1 and T3 at least) that Othon once had the Shroud. Sounds credible? Not to me. Sounds rather like a big conspiracy theory. One coincidence -likely an accident. Two coincidences -perhaps still an accident. But three? -something must be afoot. Of course. This is an explicit point I discuss on the web page about the theory of the Sainte-Chapelle: showing that the Mandylion did read the Sainte-Chapelle. See http://sindonology.org/sainte-chapelle.shtml#ans:mandylion_reach. I do not assume that this the Shroud of Turin. See the five clearly separate questions with answers on the web page http://sindonology.org/sainte-chapelle.shtml. Search for “Did the reliquary of the Mandylion reach the Sainte-Chapelle?”. 11/24. Item ung escrin de fust peint où il y a ung grant sainctuaire sans escript. I suppose the word “grant” does not describe physical size. And “sans escript” suggest that they didn’t even look inside. Had the Shroud been there, it certainly wouldn’t have passed unnoticed. I suppose the box did indeed contained the Shroud, but by 1241 was already empty. Theodore Angelus wishes long life for Innocent [III], Lord and Pope at old Rome, in the name of Michael, Lord of Epirus and in his own name. In April of last year a crusading army, having falsely set out to liberate the Holy Land, instead laid waste the city of Constantine. During the sack, troops of Venice and France looted even the holy sanctuaries. The Venetians partitioned the treasures of gold, silver, and ivory while the French did the same with the relics of the saints and the most sacred of all, the linen in which our Lord Jesus Christ was wrapped after his death and before the resurrection. We know that the sacred objects are preserved by their predators in Venice, in France, and in other places, the sacred linen in Athens . . .
Rome, Kalends of August, 1205. The Shroud was elsewhere at that time. Just an empty casket remained. (and he is not Othon). Yes. But the fact that there were at least three alleged burial cloths in Constantinople is essential to answer objections of those who claim that Mandylion couldn’t have been a burial cloth, as those are listed separately in various inventories of Constantinople’s relics. I think that you are not convinced that T1 has been written by someone who made up the story about Othon. This is why you still think that this story is possible. I believe that reading the entire manuscript might convince you (you know that I transcribed the manuscript and that an electronic copy is available. It is in French). It is actually essential to read it if you want to claim that the theory about Othon is likely true. T1, T2 and T3 are not known to have been done at the same time. So, your claim that they were done simultaneously is a major assumption on your part. What do you need to be convinced that the coffer has no documentary support and that it is very likely a modern invention? Would a statement from the countess or the librarian of the castle be enough for you? As for the Mandylion, you forgot the most important element: the Golden Bull of Baudoin II. It states that a cloth was in the reliquary. That document was written in 1247, six years after the reliquary of the Mandylion was received in Paris, and given directly by Baudoin II to Louis IX and the clerics. They would not have verified what that document says compared to what they had? Very unlikely. It is very unlikely that did not receive the cloth. Also, inventory L is referring to a previous inventory (which we no longer have) which has the word “toile” in it to describe the content of the reliquary. There was therefore a cloth in the reliquary seen by the clerics of the Sainte-Chapelle. BTW: This academic book awaits for about two years on my bookshelf for me to have it read. The title is “The King and the Crown of Thorns: cult of relics in Capetian France”. Maybe I will find some time already..
T1, T2 and T3 are not known to have been done at the same time. So, your claim that they were done simultaneously is a major assumption on your part. No – I don’t assume they were done simultaneously (if letter of Theodore Angelus is genuinely from 1205, at least in most part, I can’t). The only think I assume is that they (at least either T1 or T2 and T3) were done independently. Which is likely given 1000 miles distance between Palermo and Besancon. As for the Mandylion, you forgot the most important element: the Golden Bull of Baudoin II. It states that a cloth was in the reliquary. That document was written in 1247, six years after the reliquary of the Mandylion was received in Paris, and given directly by Baudoin II to Louis IX and the clerics. They would not have verified what that document says compared to what they had? Very unlikely. The golden bull says only about sanctam toellam, tabulae insertam and provides no details. Very unlikely had they known the Shroud of Turin was there inside. And so with the word “toile”. “It is indeed surprising that if there was a large cloth in the reliquary of the Mandylion, and that it bears a complete body image of a man, that the clerics would not have noticed it. However, the inventories of the Sainte-Chapelle gives numerous clues that the clerics barely analyzed the relics beyond their direct observations inside their reliquaries and without manipulating the relics. For example, the authorities in charge of the inventory A did not try to identify more precisely the nature of the relic for item eleven because they wrote “sans identification” (with no identification). This detail shows that the clerics in charge of safeguarding the relics, at the Sainte-Chapelle, not only did not know the real nature of that relic but that they were not in charge to find out. This lack of curiosity is surprising for us today, but the clerics did not have the task to deeply analyze the relics, and certainly not in a position to determine their authenticity. Their duty was to safeguard the relics, so that none would be damaged, desecrated or stolen. When inventories were done, they describe what they could see without modifying the reliquaries and the relics. It is equally possible that the reliquary was already empty (since 1204) when sent to Louis IX -and no one checked what’s inside, merely accepting the word that it was used previously to hold some great cloth. This is better explanation for all the facts and documents known (including T1, T2, and T3). And it inconceivable that had any King of France been aware his ownership of the Shroud of Turin, he would give it to a mere vassal like Geoffrey de Charny. You can not to bother what de Charnys stated -they clearly had some secret to hide. I think there must be a language barrier. You keep asking the question. Note that you wrote previously “What if A)? This means that all (very obscure to general public, and at least T3 is distanced from the two others) T1, T2 and T3 must have been simultaneously faked”. So you were assuming simultaneous creation of these. The question was not about the Shroud of Turin, but whether there was a cloth (“toile”) received in the reliquary. The Golden Bull says “sanctam toellam”, this is a cloth. Thank you Mario. We will add the reference to your document and adjust our comments. Along with Piero we had not seen your study: “The Shroud of Turin and the Sainte-Chapelle.” Indeed it is a very interesting study and we can certainly use it to add better clarity to the entry in the Critical Summary on “The Relics of St. Louis of France”. The major point however of the narrative presented in the Critical Summary remains:The Mandylion is currently lost and it has been at least since the time of the French Revolution. Have you read the inventories of the Sainte-Chapelle that mention the reliquary of the Mandylion? Did you notice that the image of the face of Christ (i.e. the Veronica) is mentioned as being painted at the bottom of the reliquary with no mention of a cloth? Mario, we have not read these source documents. We relied on secondary references for our Sainte-Chapelle item in the Critical Summary. TSC thinks the historical evidence strongly supports the position that the Shroud and the Image of Edessa or Mandylion were two separate cloths. Our entry on Sainte-Chapelle simply aimed at showing how important the Sainte-Chapelle relics were, including the Mandylion, and that the known history of the Mandylion ended there. Your comments are appreciated. We will familiarize ourselves with the documents you have identified, including yours, and make an effort to be sensitive to them in any future update. Thank you. The Mandylion has two quite separate historical traditions: as an icon and as a relic. The icon took a life by itself, but the relic was essentially never shown to the public. The Mandylion (the relic) reached the Sainte-Chapelle, but that it was not destroyed during the French Revolution is also almost certain. And again, the inventories of the Sainte-Chapelle must be analyzed carefully to realize that. Thanks to add a pointer to the theory of the Sainte-Chapelle on my website to your document. In your document, you also point out the theory that the Shroud came to France with Othon de la Roche, and consider it to be very reliable. But this is very unlikely. This is one of the theory that is repeated by many, but without looking in details at the original documents. It lacks any reliable foundation. It becomes quite clear when you can read all the French documents, in particular the manuscript 826 of the Bibliothèque de Besançon, related to that theory. This is the source of that theory. I wrote a book in French on the subject of the Shroud of Besançon (see amazon.com or my website) with a transcription of the manuscript. In a few words: that theory exists purely on repeating false statements made in the 18th century but rekindled recently (1981) by a copy of a supposed letter to pope Innocent III dated 1205. The authenticity of that letter is questionable. And all the theories that passes the Shroud from Othon de la Roche to the Lirey chapel contradict what have been said by the Charny family and the clerics at Lirey. Is there a way to replicate a dematerialization process like the one proposed by JJ in a lab? I am not being cynic and would really like to know. This is here said for the sake of clearness. due to problems of lack of time available. book eight years ago… ). So, if you use this paper as a reference, it would mean that the identification of the coffer would be based on the MS 826, which is fanciful. The coffer would have no basis according to that statement. 2) Jean Richardot (the librarian at the Ray Castle) confirmed to me in a recent email that he searched the entire “chartrier” (the archives of all “chartres”) of the Castle of Ray, and the word “suaire” does not appear anywhere in it. Conclusion: there is no evidence that the coffer was used to carry any shroud. I know, Mario. Besides it is this paper https://www.academia.edu/3663742/Piana_Valencia_2012 , not the previous (from ENEA 2010) I quoted. Non sequitur, Mario. There is nowhere said that the identification of that particular coffer, as used to carry the Shroud, is based on MS 826 (or any other document). The precise date (1206) on the 20th century label is based on this theory, but this is irrelevant (as all other unreliable details). The point is that there is a claim that some coffer was used to carry the Shroud by Otto. This claim can be true or false -basing on mere coffer and lack of documents we don’t know -but combining this information with other documents (t1 and T3) we can make a good case for the claim that Otto had once some shroud stolen from Constantinople (and for nothing else). Banding Proves Cloth Was Not Repaired? Dan Spicer: We have a simple explanation.